Wild Heart Bedroom Pack contains: linen duvet cover in blush (includes 2 pillowcases), linen sheet set in ivory (includes 2 pillowcases), cotton jersey euro cushion pair in grey marle (includes inserts), "Morocco" artwork by Georgina Skinner, "Chloe - Attitudes" coffee table book by Sarah Mower, marble tray, large sheepskin, brass bell set, "Rebecca" and "Dot" cushions by Nathan + Jac. SovrumI sovrummet vill man slappna av och därför kan man med fördel välja en mjukare nyans av rosa. Få färger blir mysigare med en mild belysning. 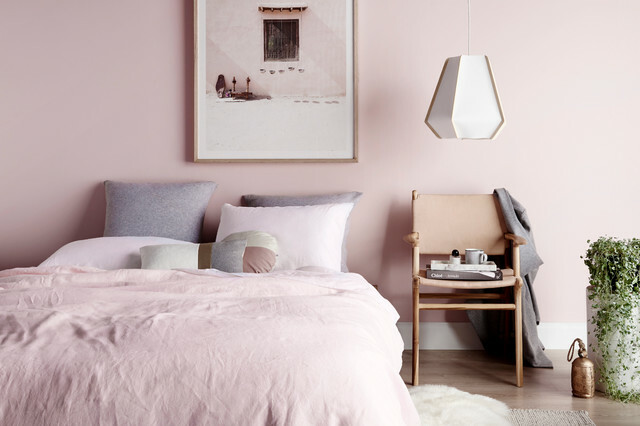 I know this is a bedroom but it gives you a palette of pink, grey, white and green. For drapery you could pull out the grey.